Last week you learned the word “hospitality” and the phrase “Thank you for your hospitality”. Now, when you thank your host or hostess for their hospitality, they often respond by saying “You’re welcome. 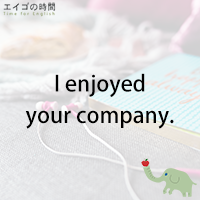 I enjoyed your company“. So, let’s look at this phrase today “I enjoyed your company”. I’m sure you’re familiar with the word “company” when it means a business organization that makes, buys or sells goods, or that provides services in order to make money. For example, Ford is a company that makes cars. But the word “company” also means the fact of being with a person or people, or the person or people you are with. For example, You like Amanda. She is good company. You always enjoy her company. Amanda likes you, too, and she enjoys your company. You and Amanda enjoy each other’s company. hospitalityつまりおもてなしを受けたら、もてなしてくれた人、hostやhostessにお礼を言います。彼らはしばしばこう返してくれます。You’re welcome, I enjoyed your company. Next Post 会社が楽しい? – I enjoyed your company.